The first time I ever tried Boursin, I made it myself. I had been hired, whilst in culinary school, to help cook for a small catering event. I was instructed to make an appetizer of baby potato w/ a dollop of boursin cheese; a finger food to pop into your mouth in one bite. I was told that buying Boursin was fine (and delicious) but based on the amount we needed making it would be just as easy. So there I was making a batch of Boursin. In truth, and in a pinch, I do buy Boursin. Making it though is an infinate treat. I made some for a dinner party this weekend. With herbs still growing in our gardens all I needed was a few ingredients from the market. 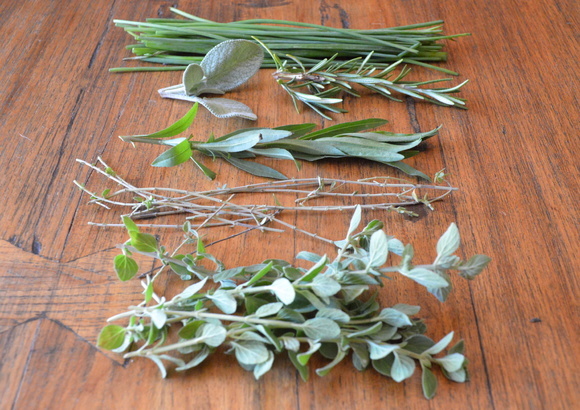 Can you name all the herbs? Place all ingredients in a food processor. Process untill all ingredients incorporate and the mixture becomes a smooth paste. Pour into an airtight container. Can be stored in the refrigerator for up to 2 weeks. *Bring to room temperature to soften. *To melt, place in microwave for a few minutes, checking and stirring at intervals. *Can be used as a spread and/or dipping sauce.